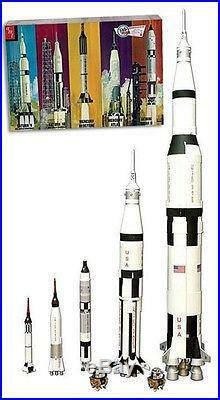 AMT 1/200 Scale "Man In Space" NASA Plastic Glue Together Rocket Model Kit Set. 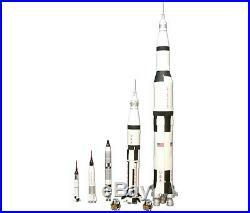 Which Includes Saturn V With Apollo Spacecraft, Saturn 1B With Apollo Spacecraft, Mercury Redstone, Mercury Atlas And Gemini Titan II. 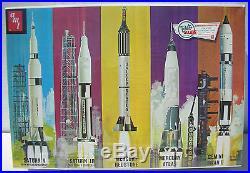 Skill Level: 2 (ages 10 and up), Glue assembly, Paint required, Five (5) Molded in White Rocket Models Included, Illustrated Cardboard Backdrop, Retro Packaging, Expanded Decal Sheet. 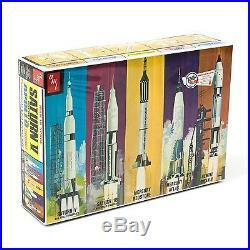 The item "AMT 700 Man In Space NASA Apollo Saturn V Spacecraft 1/200 Model Rocket Kit Set" is in sale since Tuesday, May 02, 2017. 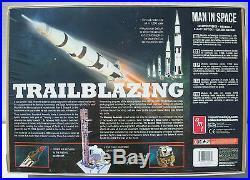 This item is in the category "Toys & Hobbies\Models & Kits\Spacecraft".